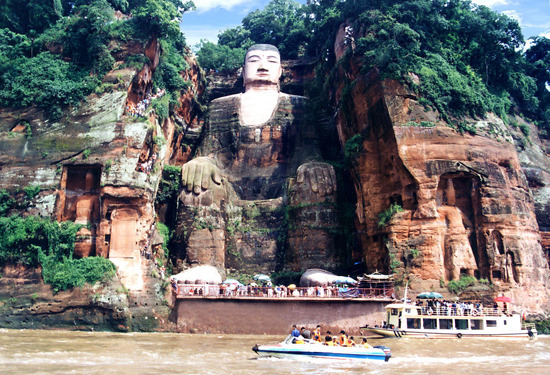 The Leshan Giant Buddha, or Lingyun Giant Buddha, is the sculpture of a seated Maitreya Buddha located at the confluence of the Minjiang, Dadu and Qingyi rivers in southern Sichuan Province, close to the city of Leshan. The stone sculpture, carved out from a cliff, faces Mount Emei, with the rivers flowing below its feet. Built in Tang Dynasty (618–907), it is the largest stone-carved sitting Maitreya Buddha in the world as well as the tallest pre-modern statue in the world (by far). Mount Emei Scenic Area, including Leshan Giant Buddha Scenic Area, has been listed as a UNESCO World Heritage Site since 1996. It easily rivals other famous stone carvings such as the Sphinx and the Valley of the Kings in Egypt. Glancing over the map of Sichuan province, you’re bound to spot many places to your liking. Here we present to you our top 10 Sichuan attractions.